Croaghmeen is the third highest hill in the S Donegal/W Tyrone area and the 939th highest in Ireland. Picture from Aidy : Lough Ancarn, just west of the summit. Picture: Lough Ancarn, just west of the summit. Climbed via Croaghnameal this afternoon, taking the same route to Croaghnameal as covered in my older comment for that hill. From the summit of Croaghnameal, I headed northeast to one of its lesser summits, then dropped down the steep north slope into the Barnesyneilly valley, before ascending the southern slope of Croaghmeen, keeping to the east of the forest going up. From the main summit there are good views to the north and the main Bluestacks range. I assume the views to the west are also good, as they are on Croaghnameal, but today was very hazy, and Donegal Bay was barely visible. 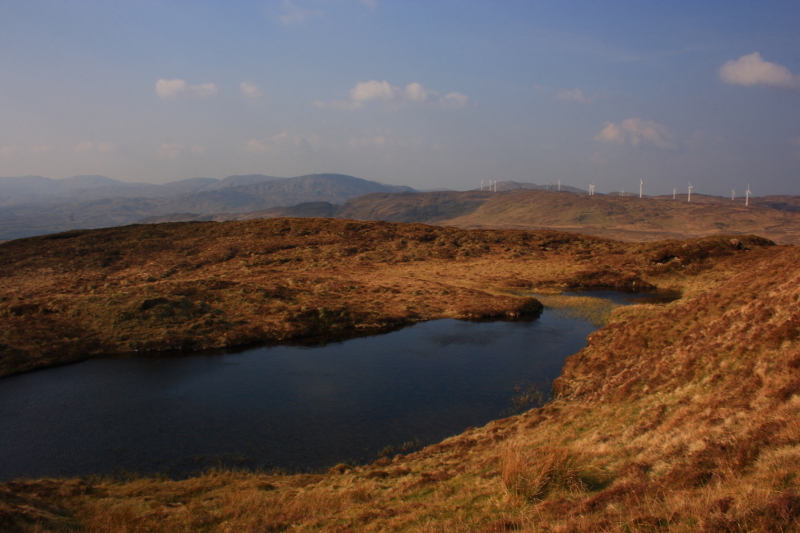 I continued west to another minor summit at 387m high, passing the little Lough Ancarn on the way. I should have taken a walk to the north from here, as I completely missed seeing Lough Ascolta, only learning of its existence when I got home and checked the map. However, by now, I needed to start back, or risk making part of the journey in the dark. I cut back along the southern slope, well above the forest below until I rejoined my original route, into the valley east of the trees and back up to Croaghnameal.